Antrim made it two wins from their two Leinster SHC qualifying group games with a 2-18 to 1-17 victory over Carlow at Dr Cullen Park on Sunday. PJ O'Connell scored an early goal for Antrim and the Ulster side went on to hold a 1-11 to 0-12 lead at the break. Saffrons forward Paul Shiels was in superb form and he slotted over his 11th point before O'Connell netted again to put Antrim six points ahead. 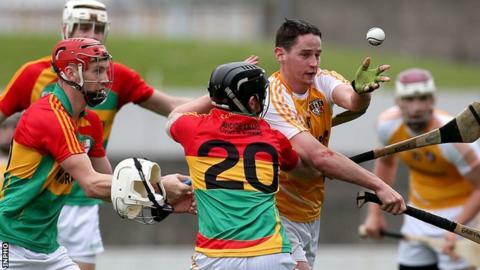 Marty Kavanagh's late penalty gave Carlow hope but Antrim held on. Kavanagh hit the net with five minutes remaining to close the gap to three points and set up a tense finale. O'Connell eased Antrim nerves and sealed victory by firing over a point in the dying seconds. It was a third straight win for Kevin Ryan's side, who top the round-robin table on four points. The Saffrons struggled to subdue a Westmeath team that finished the game with 13 players in last weekend's opener at Ballycastle. Antrim are back in Leinster SHC qualifying action next Sunday with a Ballycastle clash against London.